The Buried Lead. 2011 State of the Lake. Lake Tahoe from edge of pier. Sugar Pine Point State Park. California. 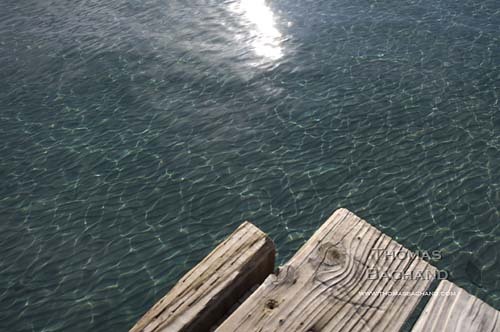 A couple of years ago on a warm, mid-summer day, we launched our kayak onto Rubicon Bay’s clear and smooth waters – so clear, it felt as if we were flying over the rippled sands 20 to 30 feet beneath Tahoe’s surface. Paddling toward deeper water, the sandbar suddenly ended and the lake bottom plunged into the darkened depths. As if suspended, we felt a sense of vertigo. Following the publication of the 2011 State of the Lake Report by the Tahoe Environmental Research Center and its finding that lake clarity dropped by four feet in 2010 (to 64 feet), there were a number of articles on current conditions at Tahoe (UC Davis, Los Angeles Times, KQED). In recent decades Tahoe research has become increasingly sophisticated and comprehensive. While the Secchi disk depth-visibility measurement continues to be the benchmark on clarity, today, a more broad set of factors are being examined, including stream runoff, road dust, lake temperature and mixing, invasive species, forest conditions, and remote sensing data. It is clearly understood that Tahoe’s problems circulate with the waters and are not confined by borders. My summer Rubicon excursion leads me to believe that next year’s State of the Lake report will detail a steeper decline in clarity. The buried lead in the report is that, just as the lake knows no borders, our political approach must not either. The authors underscore the need for continued cooperation between California and Nevada (i.e. support for the Tahoe Regional Planning Agency – TRPA). Meanwhile, the media has given little attention to Nevada’s intent to pull out of TRPA. The state feels the bi-state agency hinders development. Many of us find this odd as TRPA exhibits a pro-developer bias and has yet to turn down a major project. Regardless, California’s politicians are scrambling to negotiate with Nevada. Nevada’s tactics are familiar: invent a crisis whose resolution serves your special interest. Lake Tahoe now finds itself the latest target of the deregulators and science deniers. Rebirth. Mountain Blvd. 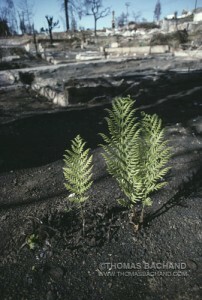 Aftermath Oakland Firestorm 1991. On this twentieth anniversary of the Oakland Firestorm I am revisiting my photography and writing created around the time of the catastrophe. I have put together a web page that contains 36 images shot during and after the fire, an essay on the events of that day, and the introduction to Lake Tahoe: A Fragile Beauty, where I discuss our relationship with fire. Feel free to pass it along. With Fall comes shifting weather patterns and, for the high Sierra, high altitude winds, thunderstorms, and spectacular cloud shows. 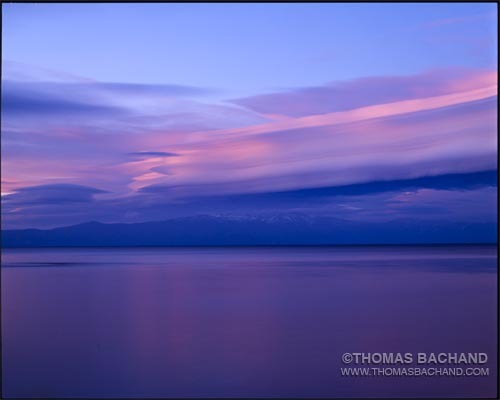 The cover photo for my book “Lake Tahoe: A Fragile Beauty” was an afternoon in the making, as large lenticular cloud formations took shape over the lake. I kept an eye on this one throughout the afternoon and, was surprised that it was still holding shape as the afternoon waned. Along the west shore I found a good vantage for the southern end of the cloud, the remainder of which stretched nearly to North Shore (below). 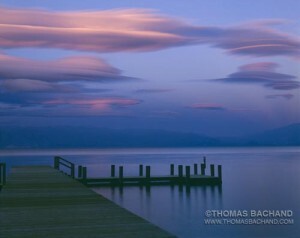 These exposures came well after sunset as the last of sun’s glow was reaching the clouds and skylight was bathing all in blue. The exposures are approximately one minute at f64 on a 4″x5″ large-format view camera. I wanted to add my voice to those offering condolences to the Jobs’ family and the Apple community. There is much being said about how Jobs developed many great products and improved the consumer experience. Of more importance to me and many other creatives, though, has been the tools unleashed by Apple products and how they have allowed us to do what we do. The Macintosh and OS X, along with software by such companies as Adobe, has completely transformed what I do and how I do it. Every step of my workflow, from creating a photograph, to correcting, printing and distributing it, whether by print or web, has Steve Jobs’ fingerprints on it. Multiply this by a couple billion and you begin to see the impact of Steve Jobs.